One nice thing about summer is the availability of fresh herbs -- whether from the farmer's market, or your own backyard! If you don't have a garden, you can even grow herbs in pots, which is what I've done for many years. Basil is a popular herb, with many varieties to choose from. My sister just introduced me to "Boxwood Basil" which has tiny leaves and grows much like the boxwood shrub. Last year I planted a few rows of mixed basil seeds and ended up with some lovely purple basil mixed in with four other kinds. I'm sure most of us think of pesto, or caprese salad when we think basil. Caprese salad is my favorite salad of the summer, but basil doesn't need to stop there. Think of it as an addition to a green salad, a topping for a plate of sliced tomatoes, the fragrance on top of a pile of fresh pasta, and even, paired with fruit, the end note to a lovely meal (see below). 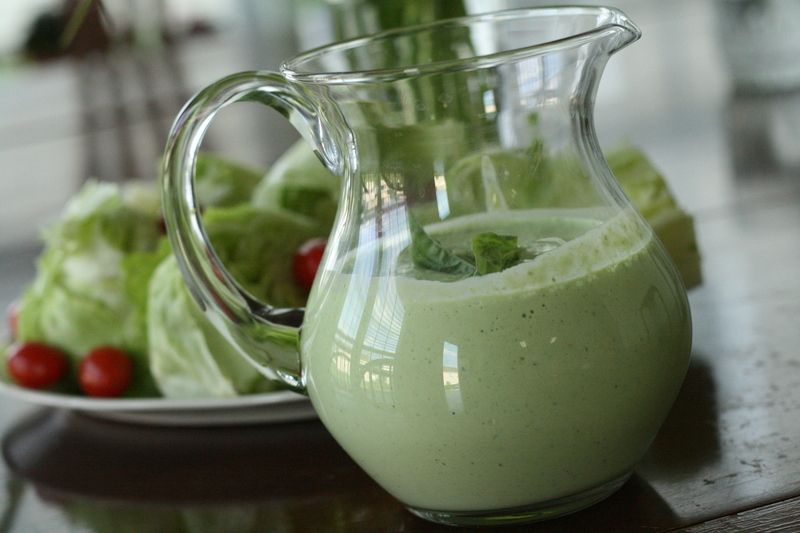 This Basil Green Goddess Dressing from Ina Garten is delicious! And a sure way to make the most of your summer crop. And, when the basil runs out, why not try it with another herb, such as parsley or tarragon. It wasn't until a few years ago that I even contemplated pairing basil with something sweet, such as peaches or nectarines. I was pleasantly surprised to find the combination worked! 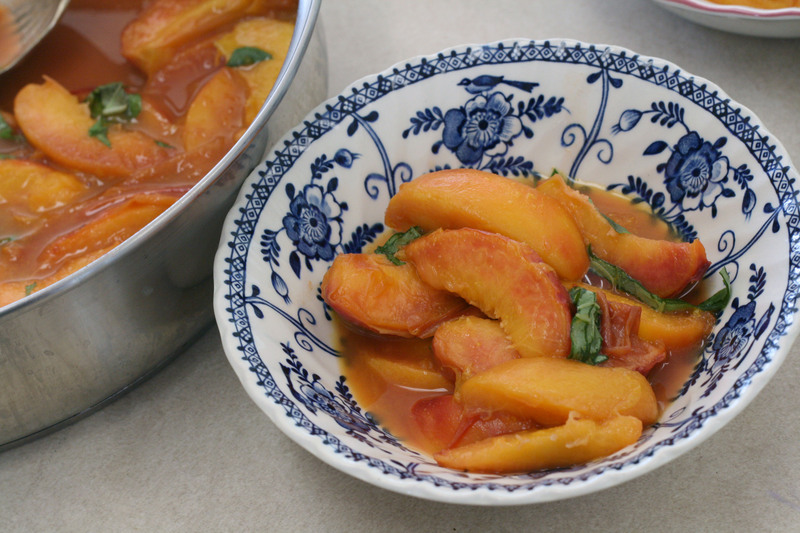 This is a fresh and easy way to make a tasty summer dessert, and if you don't want to cook the peaches, you can just slice them fresh and add a squeeze of orange juice and some shredded basil. Melt the butter in a frying pan, add the peaches or nectarines, then cook both sides until slightly softened, about 3 minutes. Add the honey and stir to make a sauce, then add the orange juice and allow to bubble briefly. Stir in the basil and serve warm with scoops of ice cream. I have been contemplating the need to grow herbs in pots, and your post has given me the inspiration to begin! Do you grow your herbs outside, or bring the pots inside the kitchen?